The mystery of the Dendrome is uncovered and the truth unveiled, that the Hive Queen of the Architects, Inyr’Kta, is scheming a plan to launch an all out attack on the planes themselves! In order to have any hope in defeating this foe it requires the use of the Infinity Gate. Uriel and Kira need the ascended’s assistance for the task of conjuring a doorway, against a dire clock, to another Plane where you’ll go and find the Plane of Earth and face unthinkable creatures. Inyr’Kta and her Architects are building a colossal force with which they mean to unleash upon the other Planes and it is up to you to unite and seek her out. RIFT 2.4 marks the first mobilization of forces in a new war where explorers and warriors of Telara will face world-breaking creations built specifically for this: Planar War. To control the Infinity Gate you must help Uriel and Kira while they attempt to focus in on a specific Plane, since they don’t know how it works, they trigger the gate and pull in beings from the Planes at random. An important note is that this Raid does not ‘have’ to be completed before you enter Planebreaker Bastion, however, it is considered the easier of the two. Once the Raid is triggered, using the orbs at the altar, you must first defeat a few groups of adds before the 1st boss, Breaker X-1 ‘Onyx’ : Originally from the Plane of Earth, created by the architects. The original concept for his creation was to take the war to other Planes and he was the first precursor model before the planebreakers that will be met once beyond the Gate and onto the Plane of Earth within Planebreaker Bastion. Left on that Plane for eons the battle hardened and radiation spewing Breaker X-1 ‘Onyx’ is suddenly yanked back to Telara by your group of Ascended. Throughout the fight you will have to invade the internal structure of ‘Onyx’, slaying his advanced AI holographic projections in order to achieve victory over him. The Twin Brothers: both originally from the Plane of Life but for reasons unknown to History one of them ventured onto the Plane of Death reportedly to discover the ancient and wondrous powers that exist there. Now through the Infinity Gates intense focus into both Planes Uriel and Kira, with your Ascended assistance will drag them forth into our world. Two platforms emerge floating above the Gate grounds a Life rift and Death rift sits upon each platform, one with Viktus, Life rift, and the other with Morden, Death rift. The two will share a health pool, blast each others platform with AoE damage as well as each apply their own debuff to Raid members standing on their platform. Viktus will give players a debuff which reduces the amount they are healed by while Morden will reduce your overall HP, each stacking over time. You will need to use the platforms portal which takes you to the alternate one and begins taking off your current debuff while applying the new one. Be careful though, if you move to the other platform too early the portal will do heavy damage, however, it is reduced once you have at least 4 or 5 stacks. The final encounter should be familiar to most Telaran explorers from the zone event in Ashora – Volan, and he’s bigger and badder than ever. With the massive size of Volan in this new appearance his attacks will be mostly Raid wide with a few unique abilities for the Tank including Spineshatter which has to be taken by him to avoid losing the Raid from it. Volan was banished from Telara to the Plane of Air after your first encounter with him and now the Infinity Gate is focused on that Plane and he has been dragged through back to Telara. Inyr’Kta has exiled herself deep within the Plane of Earth behind the walls of the war foundry Planebreaker Bastion she is protected by mighty servants bound to her will. She alone directs the forces bent on the complete control and annihilation of beings on all Planes, including our own. 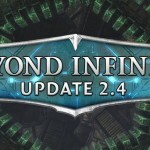 Little is known about the bosses within the expansive constrction site of giant creations within the factory and is expected to be seen on live shortly after RIFT 2.4: Beyond Infinity has been released. There will be 5 bosses within the complex whom will all have their own difficult components to overcome, this is by no means a simple Raid environment. Raids will be challenged to their own limits and it is believed that many, once prepared and suited up for the encounters, will still likely experience it as a brick wall that will take time to overcome. 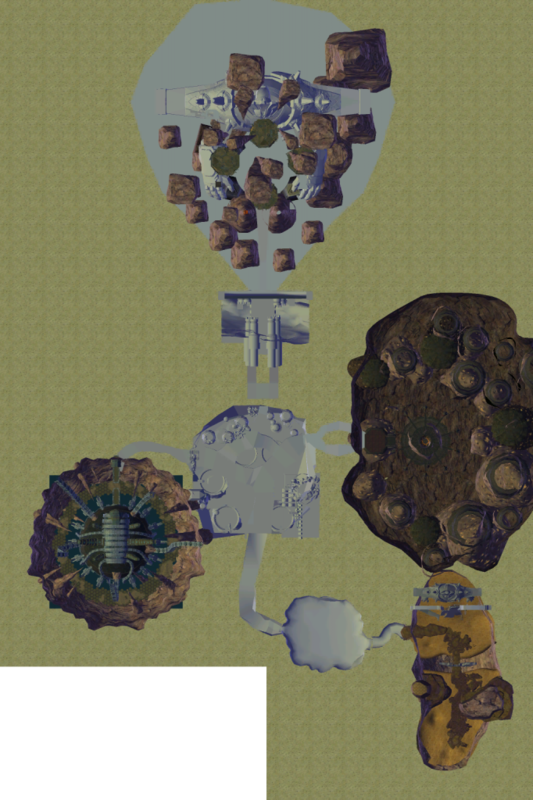 The above image is contributed through data mined by TehFrank and posted on RIFT’s Forums. TehFrank’s Profile. An event has given rise to powerful twisted manifestation based off fears harbored by, the much loved by Telarans, Atrophinius himself. Cloaked in disguises of familiar foes they seek to break out of Atriphinius’ sub-conscience prison, a warped version of the popular and familiar Realm of the Fae, and wreak havoc upon Telara. The dangers and eery environment of Realm of Twisted Dreams will be somewhat recognizable with some foggy elements and gloomy voices taunting you and your companions. You will be greeted first by Maelow who has become a magnet for popularity amongst the twisted Fae whom will do whatever is asked by him. His entrance is comparable only to that of a great rock star, his fans begging for him and barely able to remain conscious at the site of him. Reputation building his fame is only destroyed because of Greenscale devouring his Fae minions. Hunger consumes Greenscale in this iteration and he simply wants to eat anything he can, beginning with Maelow’s Fae followers who you will herd and push towards Greenscales until he is full. At this point he will manifest himself into a great bone dragon and with his transformation he will turn his attention to the Ascended in his midst and attempt to devour them as well. A return of Atrophinius in a dream reincarnation of his former self which is deeply conflicted between the ally he is to become and his raw instincts that makes him a warrior. The usual mead element, as always with Atrophinius, is ever present with a number of huge kegs players must use to avoid a powerful charge from him. Players may also drink the mead for a fun and useful effect within the fight, be careful though or you may keel over due to drunkenness. Along the frozen slopes approaching the dark throne, affected by the Plane of Water, Frozen Terrors bar your path to the true evil present in this twisted realm. A strong cold debuff, applied to all group members, will need to be removed using the bonfires in the areas lest you die of hypothermia. 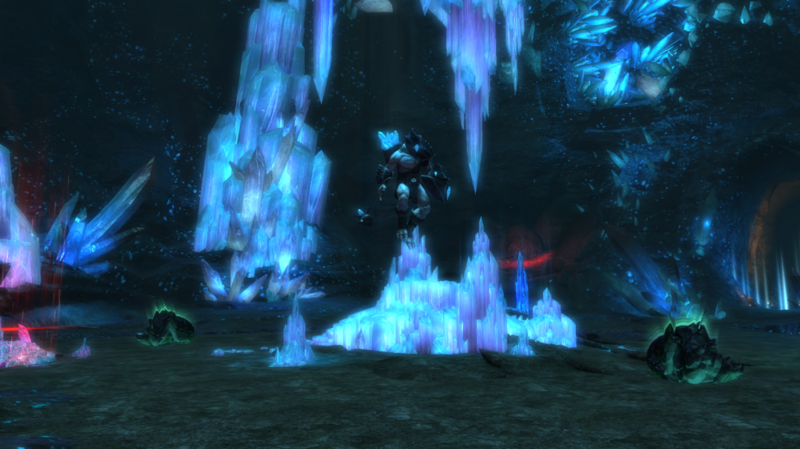 The manipulative beast wearing the skin of Twyl has it’s own plan and desires to break out of this hellish dream world prison and unleash his fury upon Telara. It seems to be an easy fight with a familiar setting compared to the Twyl of The Realm of the Fae until he draws you into a portal leading you to the true nightmare. Within this Chronicle, Laethys was never defeated and was able to run amok in her victory from within her lair deep within the volcano. You must break into her domain and slay the three bosses including Laethys’ scaley presence. As you enter her cave you will be able to pick up a few quests to keep an eye out for as you make your way through the Chronicle. For the first time TRION has brought Hardmodes into the Chronicles so you can be further challenged and even may have to bring a friend along to help! This should be exciting news for those Players that are more casual but still enjoy being able to get to a challenge right away. In the tunnel approaching the entrance to Maklamos’ cavern you will see a sparkling tablet on the left and a sparkling red orb on the right. If you hover over the red orb you will see that if you click it you will be enabling the hard mode for this encounter, so only hit it if you’re at least with one other party member. The tablet on the left will give you insight into the mechanics of the fight which are pretty much summed up pretty simply. Alternate DPS between Maklamos and his Juggernauts and run to each colored crystal determined by the color of the bomb he’s throwing, with a couple other damaging abilities. To reach the next boss you must first fight your way through some trash mobs which employ a familiar concept to the mechanics used with Infernal Dawn itself. You will need to pay attention to the Dreaded Longshots, Deadshot cast or face being high-fived in the face, hard. Once you reach the deck of Rusila Dreadblade’s ship, the Dread Fortune, the fight unravels similarly to how it does in the Raid atmosphere of the encounter. There are barrels that you pick up and drop on either, one of four hatches around the ship from which adds will spawn, or you can drop the barrels straight onto the heart which will cause Rusila to spawn. Once she is up there will be a number of mechanics to deal with include the adds if you’ve decided to drop the barrels straight onto the heart. Once you pass through a portal which will open after the demise of Rusila is complete, you will enter Laethys’ slumber area. Visually stunning, Laethys will fight you first in dragon form, laying down expanding AoE as well as breathing fire in a cone from her mouth, until she sinks into the floor and takes on another state entirely. Using the gold around her she transforms into a shape-shifting mass depicting a warped dragon at the same time regaining her health. Stationary, she swings wildly at you and places AoE coupled with many other mechanics used against you including the gold beneath your feet. Coming with RIFT 2.4 will be the ability to join your friends on other shards during your Instant Adventures not only in zone events! This should be pretty exciting for a lot of people that know many on other shards. The new PVP cap will be Rank 90 with the release of 2.4: Beyond Infinity not to mention a slew of new PVP gear you will be able to strive towards called Myrmidon’s. Rank 80 players can now choose between 600 Warlord Marks or 300 Myrmidon Marks in warfront dailies. 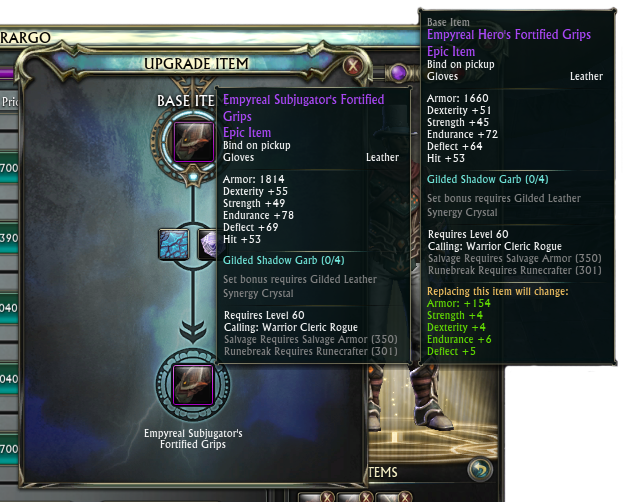 Those with Myrmidon’s gear will need to acquire Myrmidon’s Empowered Cell” in order to upgrade it. Others that are currently equipped with the Warlord’s armor and weapons, they can be upgraded as well using Myrmidon’s Empowered Cells available in the RIFT Store and Vendors in Tempest Bay. PVP gear now has the ability to be upgraded along multiple paths; you could upgrade an AP item to a CP item or an CP item to a Physical Crit item using the left and right sidegrades. While the middle upgrade path will be used to fully strengthen overall stats instead of replacing one for the other. Queuing for a random PVP Faction is now more random, you are no longer able to pick a specific team and those buttons have been removed, now there is one Join button you will click and when in a party the system does prioritize putting all Party members into the same Faction. With RIFT 2.4 comes with it Bound on Equip (BOE) recipes that will begin dropping from Expert Dungeons. This will be one of the big things acting as incentive for players to come back to doing Expert runs. Capes – There will be 2 new tiers of cloaks that can be crafted and the recipes for these will come from Expert Dungeons and will be a rare drop off bosses. Augments – New augment recipes will also be dropping from Expert Dungeons and from Strongholds as of Beyond Infinity’s launch. New seals with a main stat boost of +89 will become available to be crafted, recipes sold at vendors, as of 2.4 and new reagents will be utilized with the launch of these new items as well. 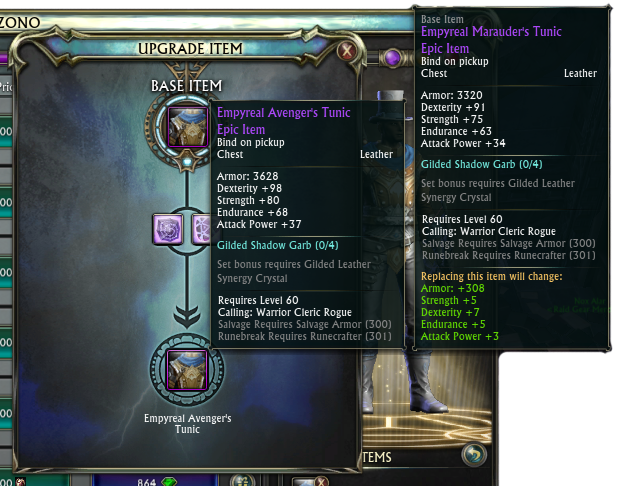 A new tier of Synergy Crystals are making their way along with the new T2 Raid content and these will also work with the new Myrmidon’s PVP gear, and gear from Grim Awakening through an upgrade path found on GA gear items. RIFT 2.4: Beyond Infinity comes with a brand new set of Tier 2 Raid gear offered by the new 20-Man instances, detailed above, and the vendor is located right beside the first Raid vendor in Tempest Bay. Above is a preview of a brand new piece of T2 Rogue Raid gear which is an upgrade to my Relic quality boots I currently have equipped. Below is a screenshot of what the Rogue Raid set will appear as, while I was on PTS the looks of the Raid gear were not met with praise, but we’ll see what the masses say when 2.4 goes live. This new gear will have Hit stats of +78. 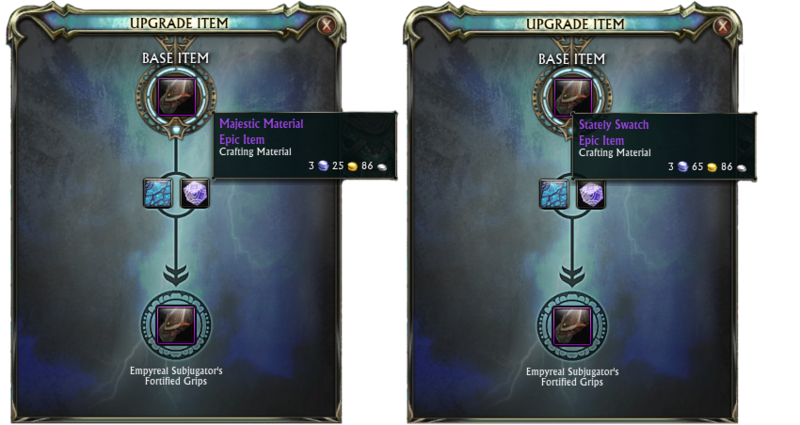 Players endowed with gear out of Grim Awakening will see that their gear has a new upgrade path previously unavailable which will allow these pieces of gear to unlock the powerful boosts from the new Synergy Crystals shown earlier in this article. Trinkets from Grim Awakening will receive an upgrade path to achieve Relic quality and will boost whatever powers it previously held: for example if a Trinket does a certain amount of damage on proc then it may leave a DoT on the target as well for a period of time with the Relic version. Something to be super excited about, in my opinion, and no I don’t have any rare Greater Essences, it’s just exciting news! 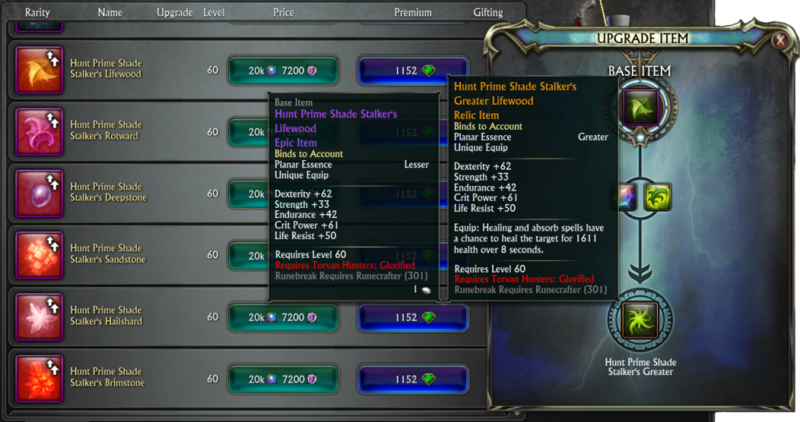 You will now be able to take your lesser essences purchased from Torvan Hunters, such as Hunt Prime Shade Stalker’s Lifewood, with the rare Greater Essences that drop from Raid Rifts and the upgrade catalyst – Lycini Plane Bender, which will cost you 9600 Infinity Stones or 1575 Credits. 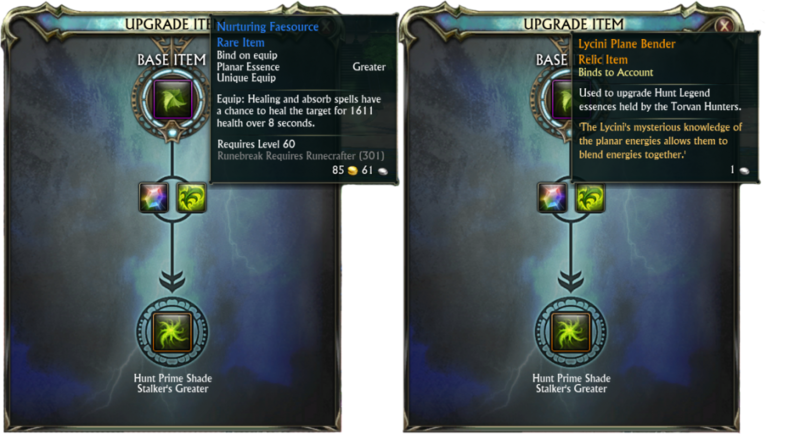 Using the Greater Essences and Lycini Plane Bender you can then utilize the benefits of the Greater Essences and couple it to work in tandem with the stat bonuses coming from the original Torvan Hunter Lesser as seen in the above screenshot. 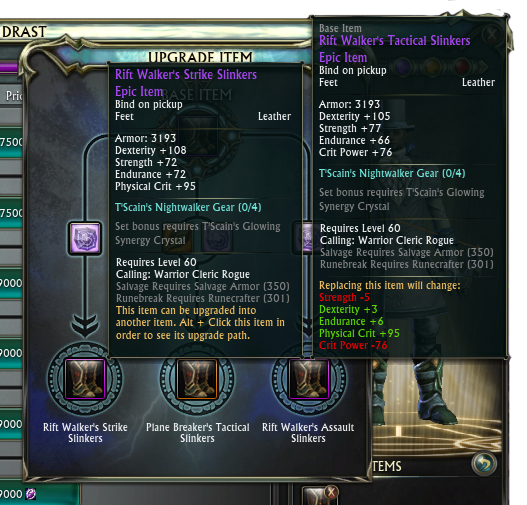 Something that RIFT is being introduced to is gear with not two upgrade paths but now, just like the PVP gear previously mentioned there are Sidegrades for your Raid gear so you can tweak the stats a bit first before upgrade it to the Relic quality item. 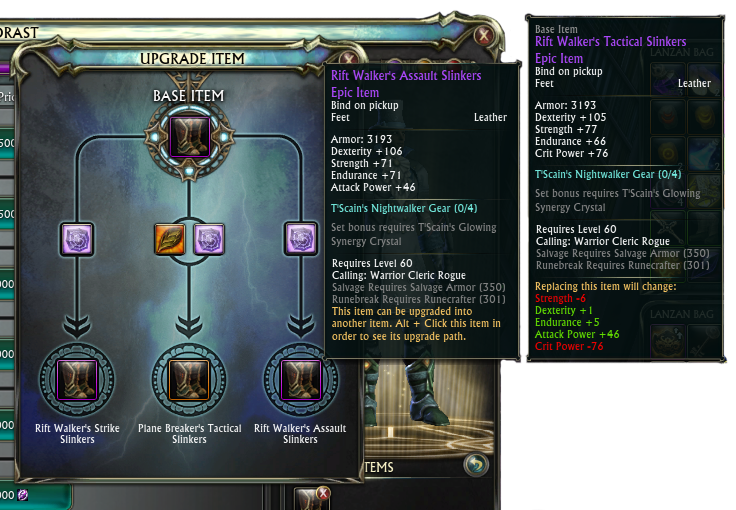 When you first select view the upgrade UI you will see three branches, the left and right branches allow you to slightly modify the stats on the item. To sidegrade this particle item it will require an Empyreal Marauder’s Large Cell which should already be familiar to you. Let’s say that you prefer to stack Attack Power over Crit Power, well by using the right upgrade path you can do just that. Maybe you’re a player that prefers or needs a little more physical gear in your stat make-up, well choose the left path and you’ll be on your way to crit heaven. Finally the main branch in the middle requires two pieces to upgrade and get you the Relic quality version of the item. 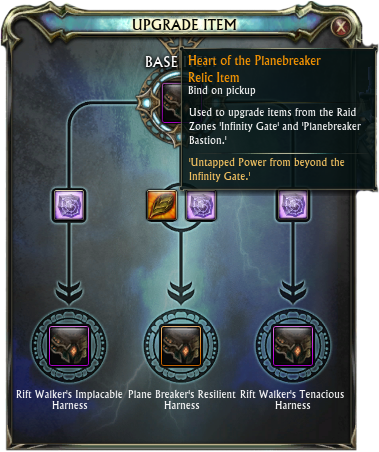 The Relic quality item requires a new upgrade item pieces presumably from perhaps one of the bosses in Infinity Gate and Planebreaker Bastion considering it’s called Heart of the Planebreaker and you will be engaging Planebreakers on the Plane of Earth and at the Infinity Gate. Frozen Eclipse Stones will be converted into Empyreal Slayer’s Marks at a 1:1 ratio with the release of 2.4 and Frozen Eclipse Stones will be used for new Tier 2 content. The weekly cap for FES is now 6,460 and the week cap on ESM is now 14,355. Things will be slightly changing when purchasing Raid gear – the Desolate armor set can be purchased using Empyreal Slayer’s Marks and rewards from bosses and chests found in Frozen Tempest, Endless Eclipse, ToDQ, and the Dendrom Raiders Cache’s will now be dropping ESM. Raid Tier 1 bosses will now be tuned to drop 400 ESM in 20 Man Raids and 200 ESM in Slivers. As mentioned above the Plane Breaker’s Raid gear set is now available on the RIFT Store from 9k to 17.5k Frozen Eclipse Stones. 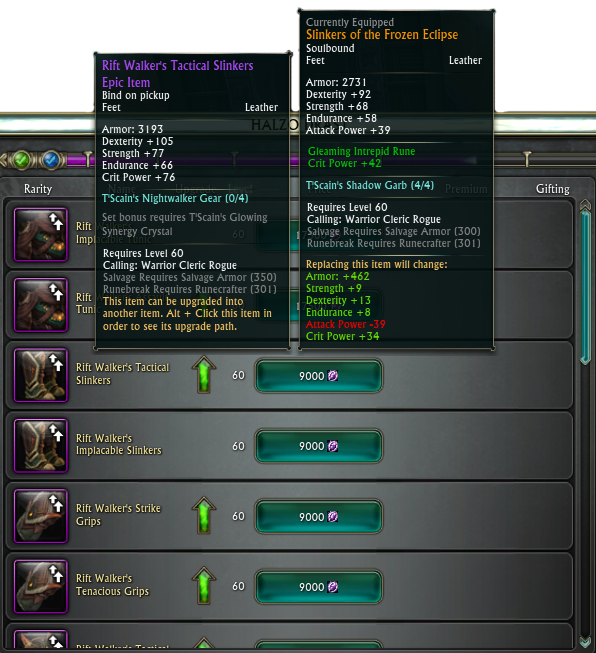 If you currently have world gear that you have upgraded to its, previously, maximum state, Hero’s status, well look again because Trion has added another upgrade level with the title ‘Subjugator’s’. 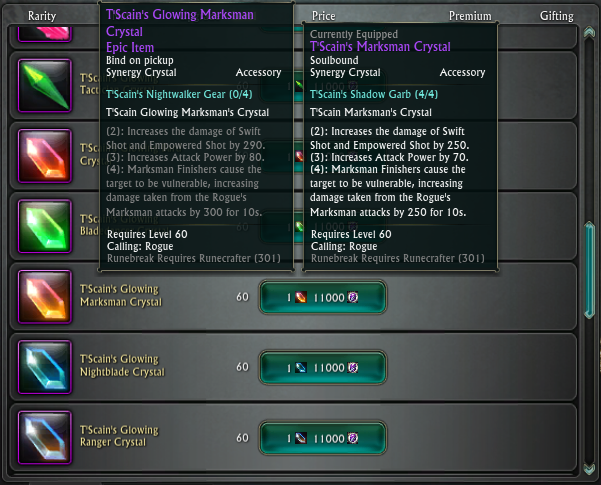 The upgrade pieces for this upgrade, in this case the gloves specifically, will be a Stately Swatch, an epic quality crafting material, and Majestic Material, also an epic quality crafting material. World gear isn’t the only group of gear receiving some loving this release, purchased Dungeon gear will have a new upgrade level. The previous title for the previously most advanced level was ‘Marauder’s’ and the new level has the title ‘Avenger’s’, for Rogue gear anyways. The same upgrade pieces are utilized to upgrade them once further but it will require the acquisition of 2 Empyreal Marauder’s Cells instead of the previous levels one to upgrade. With this new level of gear available to players it should ensure that players reach the Raiding tier with a stronger base of stats, but there are more changes amongst the 5-Man encounters that are noteworthy. End-Bosses will not be dropping Rare items any longer and these items will drop from other bosses amongst the dungeons. In order to further encourage the return of explorers to Expert Dungeon runs, new Epic quality items will be found dropping in every Expert Dungeon throughout Telara, as well as new artifacts and as mentioned above the new crafting recipes as a Rare drop. One of the most anticipated features coming with RIFT 2.4: Beyond Infinity, celebrated as soon as anyone heard word, the new and almost limitless possibilities for customization of your characters with brand new colour schemes for base hair colour and highlights. In the Barberhop UI you will notice new (+) signs next to each type of Colour for Base, Highlights, and Skin as well as one next to Hair. There will be 4 new hairstyles unlockable for each race using credits, previously the hairstyles that you’ll unlock were reserved for specific races. 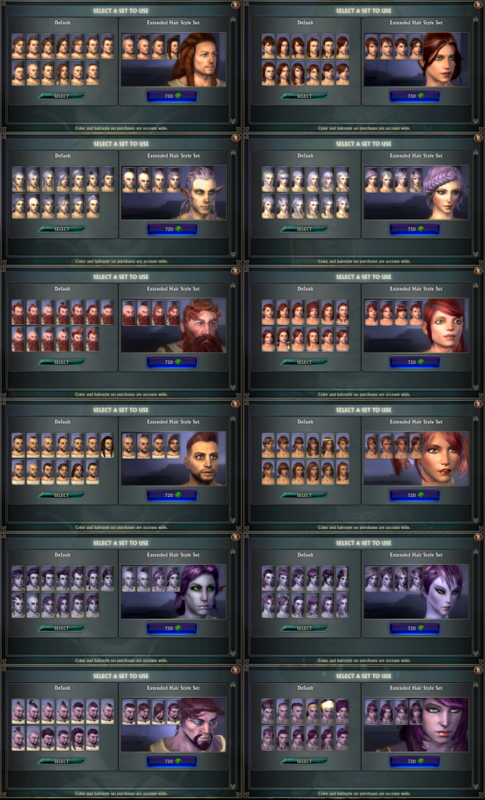 Here is a list of screenshots of hairstyles for each Male and Female characters sorted Race order in the Barbershop (Mathosian, Night Elf, Dwarf, Eth, Kelari then Bahmi) Unfortunately I did not have the credits necessary to actually cut my characters hair in these styles and take better shots. Expand the screenshot below to get a peak at what the new do’s look like. Alternatively you can buy them all; in the RIFT Store there is a new Cosmetic category under the Services tab which will allow you to see the bundles of Hair Styles available to buy, and remember these purchases are account wide. Credits will be the only acceptable currency for these colour expansions and the Extended Hair Style Set will cost 720 Credits. Base, as well as Highlights, will see brand new tone colour schemes including Natural, Intense Light, Light, Intense Midtones, Midtones, and Dark. The following collections of colours is available and the same for both the Base Colours as well as the Highlight Colours. 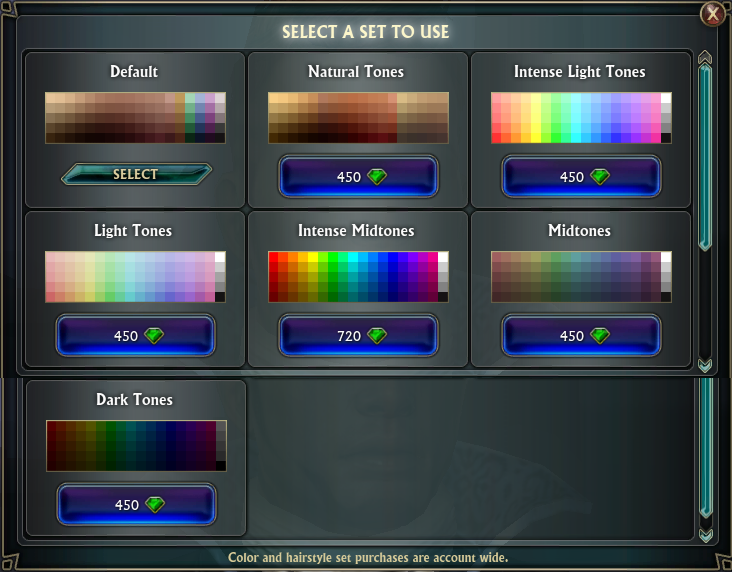 I’m assuming that if you buy the Natural Tones for 450 Credits while in the Base Colour menu of tones you will have unlocked the Natural Tones for the Highlight colours as well. I’m basing that off the fact that on the RIFT Store there is only one Hair Colour Set Bundle and not one for Base colours and then one for Highlight colours. 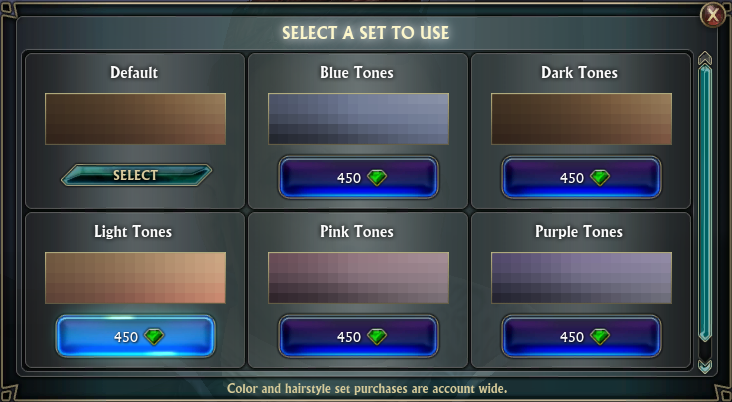 Also available in the RIFT Store under the Service tab then the Cosmetic category, you will the Hair Color Set Bundle which will cost you 2376 Credits to have full fledged access to these amazing new colours across all of your characters. As you saw with Hair Colours a similar change is in effect for Skin Tones which includes palettes Blue Tones, Dark Tones, Light Tones, Pink Tones, and Purple Tones. With the new colours available you can pretty much make any race look like, well, anything you damn well please. This news has been quite empowering to those players adept in the arts of tweaking their characters. Once again, alternatively you can buy them all at once on the RIFT Store under Services and checking off the Cosmetic category. Purchasable only with credits, the Skin Color Set Bundle will set you back 1800 Credits. A new section in the RIFT Store will be making it’s début with RIFT 2.4 called Trophies; within this new section you will be able to purchase additional copies of items that are rewarded upon completing a certain Achievement in game. These items should be familiar to you veteran players such as the Swift Soulbound Charger which is awarded upon completion of the Conqueror: River of Souls achievement. With this new section, since I have already completed the achievement, I can buy the mount for 225 Credits and send it over to an alt of mine so they can ride in style too! It appears that all of the Trophies are available for 225 Credits save for one exception. They’ve also added a brand new achievement for hitting level 15, as far as I can tell, where everyone will receive an ‘Ascended’s Lesser Signet Token ‘ upon reaching level 15 which will guide you to the Trophies section in order to redeem it and gain your first Trophy – a blue quality ring. It looks like this is so low level new characters will gain an experience with and learn what the Trophies section is about. You can see in the screenshot above, the number 15 on the items image signifying level 15, and the four rings it can be redeemed for. 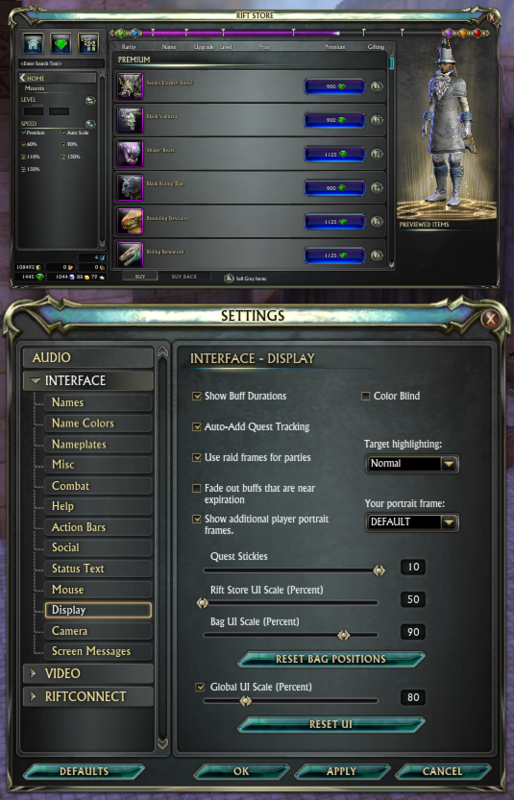 The players of RIFT called out for it and the makers at TRION heard you, it is now possible to scale down the RIFT Store UI with the Display settings. You are able to scale it down to a minimum of 50% of max, below is a screenshot of what that looks like, I can’t really see many people, if any, that would keep it this size. 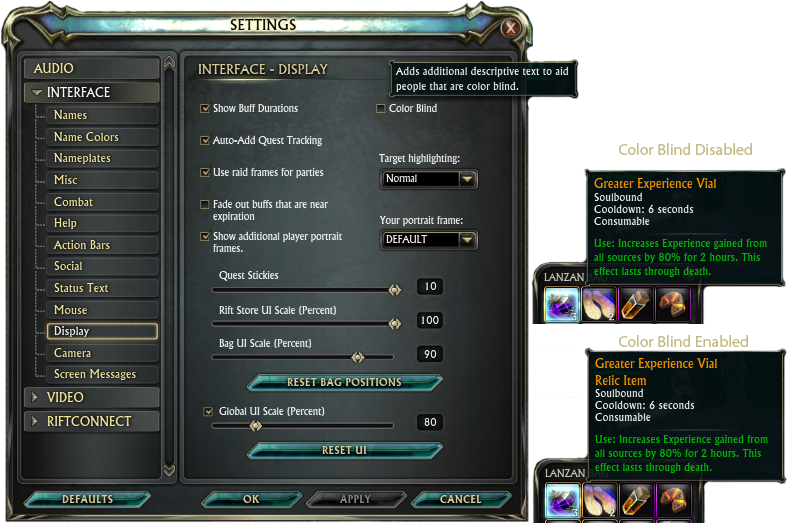 Below is some more settings and UI differences you may notice now that 2.4 is live. Along with the new Trophies section there are a few other additions made: 1) Loyalty dimension items are now available. 2) This is kind cool – Portable Auctioneer can be purchased in the Services category. 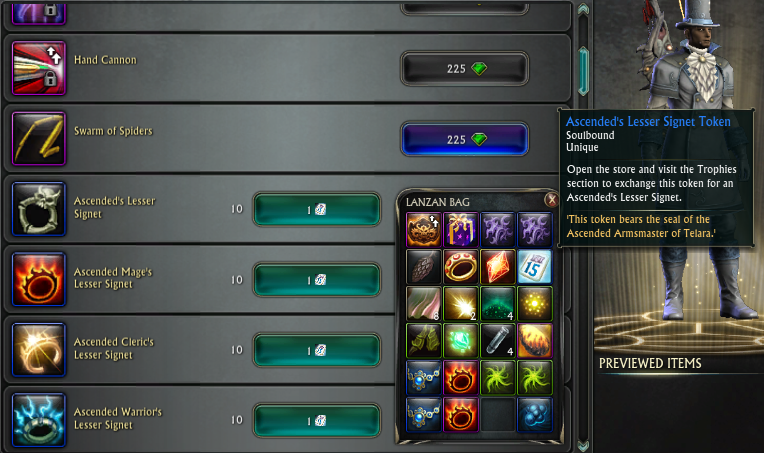 3) Upgradeable icons on the items thumbnail showing that it can be upgraded now displays properly in the Store. 4) The sorting of items in Wardrobe>Premium has been tidied up. 5) 2-Handed PVP weapons cost has been modified to be appropriate when compared to 1-Handed weapons, the 2-H cost twice as much now. 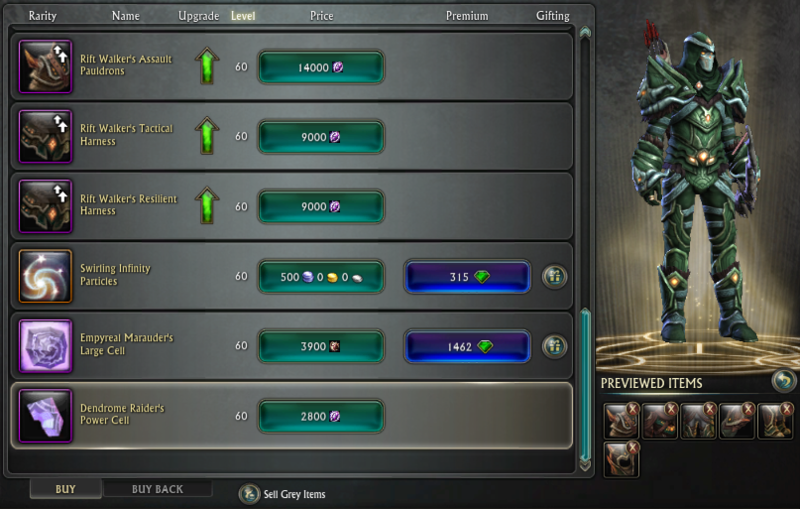 6)Reported prices of runes has been heard by your Gamemasters and prices have been adjusted. 7) Swift Platinum Eldritch Steed Bridle is now available for purchase by either faction. 8) There is a new Tasuil’s World Tree Nectar now available at drink vendors and in Store. Have you been jealous of all those people that are able to use shadows while playing RIFT and you can’t? Well TRION is suggesting that you turn on the shadows again because they’ve made some pretty big strides in the performance of this particular environmental element. Within the Video settings UI window there is a new setting called Pixel Granularity and you can scale it from 50 to 100. With this setting you can lower the rendered resolution of the game world without affecting the high-res UI = clean UI with snappy framerate. With this new settings comes a new command ‘ /pixelgranularity ‘ that enables you to create a quick “/pixelgranularity 50″ macro. The command ‘ /mentorlevel ‘ now behaves more appropriately, you can now create a macro ‘ /mentorlevel +2 ‘ in order to quickly engage in battle when jumping between zones of different levels. When using the @gtae macro command now respects line of sight. When you’re using the UI in settings and your Character, RIFT Store, or other window you will be noticing some slight modifications and more information than what was there before. Within the Notoriety Section you will see for the first time, the progression of Notoriety from start to finish. I am so glad to see this extra bit of info, it will surely cut down on the chatter and constant discussion about what is the right way; I can also get rid of my Notoriety progression wallpaper, haha. They finally fixed the little irritating, at least for myself, bug where when you Alt-Rick clicked on an item, even if it wasn’t upgradeable, the UI would still pop up – no longer, they’ve got that to stop happening. If you’ve tried to drag an ability from your Soultree to your action bar with Storm Legion souls it would only be a Rank 1 ability, that is now fixed and when you do this the ability will be your max level that you have learned. Chat console bug that was causing multiple lines of bonus loot notification in chat has been fixed, as well as the game will not crash while resizing the client during a loading screen with Low Quality Rendered enabled. The tooltip for Storm Legion souls in the soul respec UI should now show as proper and complete. Guild foraging quests with incorrect max levels have been fixed. Some macros were attempting to play after logged out, this behaviour has been stopped. Blink now works underwater, enjoy. For your bank, when you right click on an item in your bags in order to auto transfer it, the item will be sent to slots within your unlocked bank vaults that you are not viewing. Upgrading your Guilds dimension will now take the payment from your Guilds bank, as it should, instead of yours. When visiting a PvE shard from a PvP shard characters were not recieving direct heals, this should work properly now. Players that left and then re-entered Conquest would find the timer would disappear, this has been fixed. Players who crash during a Warfront will receive their due rewards for the match. You can NOT follow other players when in a Warfront or Conquest map, apparently it was a running joke until now . Players will cease to be yanked out of Warfronts and/or Conquest and placed in an IA. For those of you buying Wardrobe slots every day you can now see in chat what you bought and how much you spent when buying a slot. 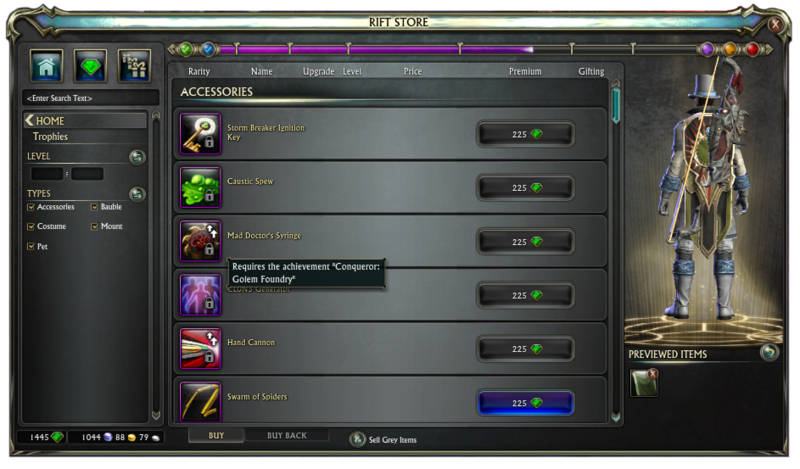 For Dimension lovers, while you’re in your Dimension you will notice a brand new RIFT Store button on your Bar which will jump you right into the dimension item category in the RIFT Store. While teleporting using the barren map to choose where to go can be a little cumbersome and I’ve even found myself closing it and opening the real one just to double check where I wanted to go in the first place. 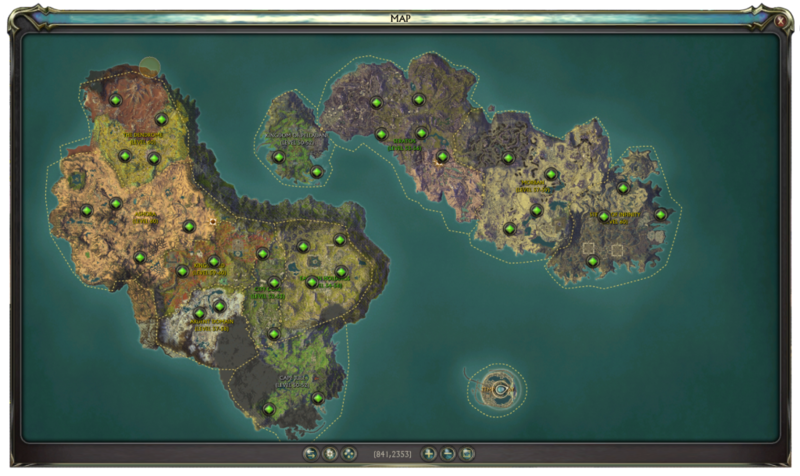 There is now a new main map you will see while teleporting that will show more information to keep you from having to switch to the regular map for that info. An interesting new feature being released with 2.4 is a color blind toggle in Options/Display which, when turned on will: 1) Add a text description of the item quality in tooltips. 2) Add an item quality description on recipe tooltips. 3) Display recipe difficulty in the Crafting window and Vendor window. For brand new players to RIFT, welcome by the way, there is a new experience for low level characters between level 8 and 20 which will introduce core features of the game such as Instant Adventures, Dimensions, and the Soul Tree. These quests do not count against your quest tracking cap and look different in the quest tracker. 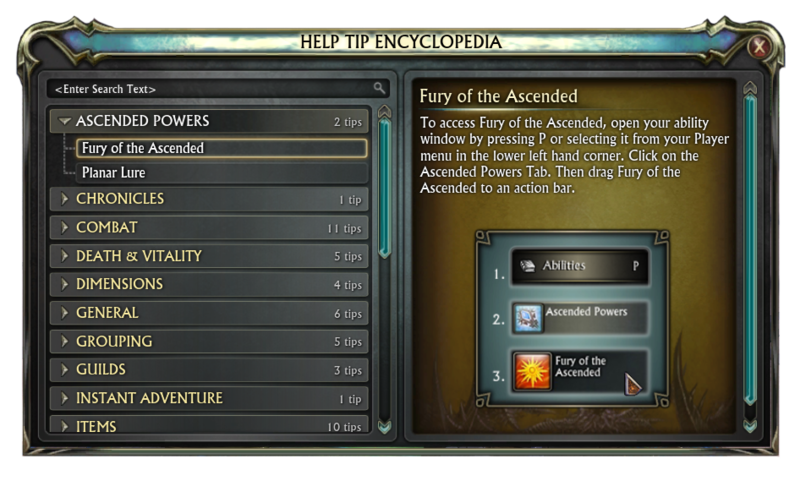 There is also a new Help Tip Encyclopedia found under the (?) icon on the player menu in the bottom left corner of your screen. A plethora of help tips and answered questions can be searched and tutorial videos can be found and replayed if you wish. If you do not need tips, you pro, then head on over to Settings>Help to turn them off. The Fishing Derby daily quests have been tweaked so they are no longer timed, this change will also ensure that Fishing Derby quest progress will not be eradicated once you’re logged out. RIFT: Beyond Infinity is out!